Ah Cherry Creek, some of the most sublime and thrilling whitewater in the nation, let alone California. 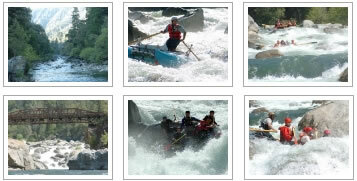 Its class V rapids provide a serious challenge and ultimate adventure to both expert kayakers and seasoned boaters. These waters should not be attempted by someone who has not had considerable class IV+ kayaking experience. Commercial rafting trips with a professional guide are recommended if you haven’t been commandeering your personal boat on other challenging Class IV+ & V rivers. Who should go: Expert, experienced kayakers and rafters; intermediate rafters should book a trip with a commercial outfitter. Whitewater rapids are nonstop on the creek. Many Class IV rapids aren’t even named. Blind drops, boat-swallowing holes, and mandatory boofs will keep your heartrate up all day. 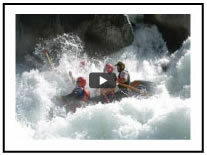 Read more about Cherry Creek Whitewater. Learn more about Cherry Creek Flows. Casa Loma is the typically meet spot for both commercial and private trips. The road to put-in is easy, but boater joke that driving Lumsden Road, on the way out, is harder than running the river. Keep reading about Cherry Creek Logistics. Watch a Cherry Creek video before you see it up close. Buy gear and other supplies for your whitewater trip on Cherry Creek in Groveland, Sonora or Online.